If you quickly want to find out what the best 4 person tent is, then I’d recommend the Coleman Sundome Four-Person Tent as the best one. In my years of experience camping, I have used and tried many different brands and types of tents. What kind of tent you choose can make or break your outdoor getaway experience. For first-time or newer campers, it can be a bit daunting to choose one of the most important items on your trip. Looking for certain differences based on your needs is important. A four-person tent will be severely different from a one-person tent. Try fitting four people into a one-person tent, and you’ll see what I mean! There are a few main things you should look for in a good camping tent. Remember, what you choose should be what is best for your specific camping situation. Right off the bat, you should decide what size tent you need. We have already established that you are looking for a four-person tent. We’ll get into more details on sizing later. In addition to the measured size, pay close attention to the weight of your tent. Will you be carrying it far distances? Or are you setting up camp in one location for the weekend? These things matter. Convenience is an important factor to consider while camping. The packability of a tent along with its setup are good things to look into before bringing it into the wild. Finally, how durable is the tent? When you’re roughing it in the wild, especially with multiple people, you are going to want a tent that’s tough. At the same time, it should be weather appropriate. A four-person tent is, of course, meant to house four people. Although, I have found that just two people in a four-person tent are very comfortable. The exact measurements of a four-person tent will vary based on the design. There are a few different kinds of four-person tents, and because of their varying shapes and setups, their square footage will come out to different numbers. Generally, a four-person tent will be anywhere from 55 to 65 square feet. That being said, be sure to look at the actual measurements of each size before buying—this includes the height. Compare these numbers to the size of people you plan on housing in your tent. You may find that a four-person tent is actually too small for four people. Cabin tents are good for maximizing the amount of headspace you and your friends can get out of your tent. They have straight up and down walls with a flat ceiling. The height will typically be the same across the entirety of the tent, allowing everyone to have the same amount of space. Dome-style tents are exactly what they sound like: they take the shape of a dome. Rather than having straight walls and ceilings, these tents have a curved top. Because of this design, the tent doesn’t have height but has a “peak height” instead. The sloped walls reduce living space, but the shape of the tent offers excellent strength against rain and wind. Which feature is more important depends on what you prefer. You might be wondering why a four-person tent, which is made for four people, seems so snug. One of the reasons for this is to keep the weight down. Technically, yes, a four-person tent can fit four people; that doesn’t mean it will fit any four people in the world comfortably. Basically, to keep the weight you have to carry down, tents are made to use minimum space and materials to hold the largest amount of people. This is also why size will vary from brand to brand. This is where you need to ask yourself how lightweight a tent you really need. If you plan on taking your family of four to a campground where you’ll set up camp and stay put, weight isn’t as much of an issue. However, if you and your buddies are backpacking and want to save space by using one tent, you’ll want to pay closer attention to the weight. Be warned though—most light weight tents tend to be extra snug. A lot of the features you should look closely at concern durability and convenience. Any savvy shopper knows that durability is the best way to get the most out of your money. 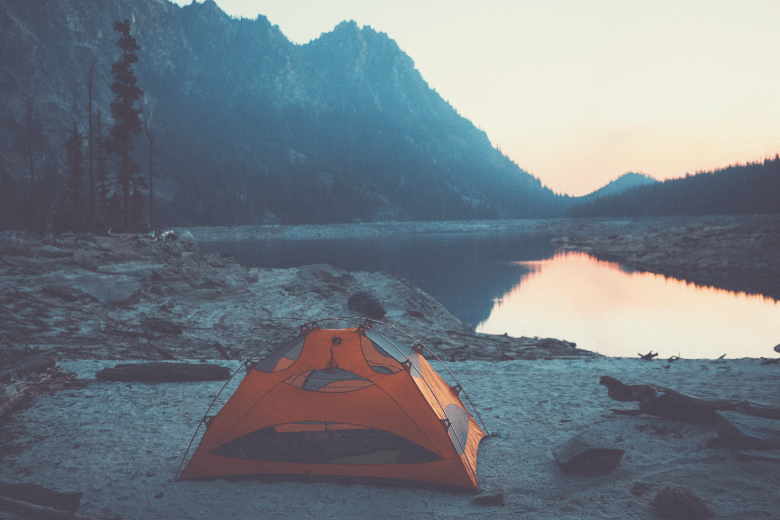 There are a few things you can check into to make sure you’re buying a tent that lasts and does what you need it to do. In my experience, I’ve found that aluminum poles work better than fiberglass poles. Fiberglass is more likely to bend or break, while aluminum will last longer and give your tent wider lifespan. Research your tent’s rainfly. A rainfly is basically like your tent’s umbrella. Pop-up thunderstorms are especially threatening during the summer, which is a popular camping season. Your rainfly shouldn’t just cover the top but should come well past the sides of the tent. A good waterproof rainfly will save you from some soggy, sleepless nights. Along with a rainfly, make sure you buy a tent with a one-piece, waterproof floor. Tents that have seams in the floor are likely to let water in. It doesn’t take a genius to realize that water on the floor of your tent is a great way to ruin a camping trip. A durable tent will have folded seams and double stitching. These features ensure that the tent doesn’t leak, and that water and insects can’t get in through poor construction. I recommend also using a seam sealer on all seams, regardless of its makeup. Good ventilation is another strong feature some people like to look for. Ventilation through windows, floors, etc. can turn a hot tent into a breezy vacation. Just make sure the ventilation uses good meshing to keep bugs out. That being said, not all tents belong in all seasons. While camping is popular in the summer, some campers like to continue camping into the fall and sometimes even the winter. For example, a well-ventilated tent would not be a good idea for a winter camping trip. To wrap all of this up, it’s always nice when your tent comes in a convenient carrying bag. Whether you’re packing it in your car and driving to the campground or backpacking with it, convenience is always a plus. Now that you know a little more about what makes a great four-person tent, you can get on to the fun part: buying one! As an avid camper, I’ve made many mistakes and learned along the way. Hopefully, these options can help you hit the ground running and enjoy your camping trip worry and mistake-free. The Coleman Sundome Four-Person Tent is a highly spacious tent suited to fit four people. Measuring 9’ x 7’ with a 4’ 11” center height, you and your camping mates can move around freely and comfortably without disturbing one another. You will find that the dome design makes it easier to set up than other tent shapes, while the large windows and ground vent offer great amounts of ventilation. Additionally, the WeatherTec system uses patented welded floors and inverted seams that will keep you dry. Some of this tent’s convenient add-on features make it an excellent choice for camping. The rainfly awning provides shade as well as rain protection. Several storage pockets make organizing your gear a breeze. Carrying gear on a camping trip is my least favorite part, so I love that this tent comes with a carrying bag for easy transportation. Lastly, the weather always plays a factor on camping trips. This includes things you may not consider, like the wind. This tent has insta-clip pole attachments that fight against the wind to keep your shelter standing. The ALPS Mountaineering Taurus Four-Person Tent is a free-standing, two-pole structure made from fiberglass poles with a polyester tent fly. Measuring 7’6” x 8’6”, this dome-shaped tent has a peak height of 52 inches. Since it uses just two poles, this tent is very easy to set up. Its tent fly is water resistant, and it also resists UV damage. These features allow you to use this tent long-term without fearing any damage. Equipped with a mesh roof, two entryways, and a zippered window on each door, I found that this tent has excellent ventilation. That makes it perfect for those hot summer nights or relaxing spring days. In addition to these features, this ALPS Mountaineering tent provides great storage with pockets and a gear loft. There are eight zippers in total. A poly taffeta floor instills confidence that you can lay down without getting wet, muddy, or buggy. Weighing 10 pounds and 11 ounces, this is a great family tent for use on campgrounds or backyards. The AmazonBasics Tent is a dome-style tent equipped for three seasons. It is made from 100% polyester, making it highly durable and sufficiently resistant. In addition to its naturally water-resistant material, it is also coated and features a welded polyethylene floor with inverted seams. This tent’s rainfly is removable, making it perfect for a sunny day or a rainy afternoon. The rainfly extends past the edges of the tent for extra protection. This four-person tent has a cool-air port that allows fresh air to flow through the tent. Measuring 9’ x 7’, the peak height of this tent is 59 inches. All of these great features come stored nicely in a storage bag for easy transportation. CORE Equipment’s Four-Person Tent is an instant-setup tent that is designed to take shape in 30 seconds. The quick setup is not only convenient but very easy. Its dome shape sleeps four – or one queen air mattress – with a peak height of 54 inches. This tent uses CORE H2O block technology to keep out rain and moisture, which the bottom features an adjustable ground vent for improved airflow. A built-in gear loft also serves as a lantern hook, while you can find additional storage in the form of pockets that are set off of the tent floor. The Instant Dome Tent comes fully prepared to use with tent stakes and a carrying bag. A rainfly is also included to keep water off of your tent. For those of you who like a little technology on your camping trips, this tent also has an electrical cord access port that you can close fully when you’re not using it. The ALPHA CAMP Four-Person Camping Tent is a spacious tent made to fit four adults. The materials include polyester taffeta fabric that has an eco-friendly PU coating. These elements together make the tent both water and UV-resistant. The rainfly is sealed, and the floor features a seam that claims to protect against as much as 1,000MM of water pressure. The poles are made of fiberglass and are easy to assemble, creating a dome-shaped tent within five minutes. The rainfly cover is set almost an inch higher than the top of the tent, which prevents the heat from the sun and rain to fall directly on the tent. This cover is detachable and can also serve as a fishing awning or canopy. With additional features like extra overhead storage space, electrical port access, and a mud mat to wipe your feet on, this tent offers comfort amidst your time in the wilderness. An all-around excellent four-person tent with outstanding features, my favorite of this bunch is definitely the Coleman Sundome Four-Person Tent. Suited to fit four adults, you get 63 square feet of space in this tent with a center height of 4’ 11” – not bad at all, considering the low end of the average four-person tent is 55 square feet. Its setup is super easy, and it features excellent ventilation through large windows and a ground vent. While being well-ventilated, you still get superior protection from the rain in this tent due to its WeatherTec system that uses a patented welded floor design and inverted seams. Add on some great storage and an awesome rainfly that blocks 90% of sunlight for mid-day naps and less heat, and you have got yourself a great tent. Unlike some of these other products, the Coleman Sundome is durable with a lot of space and ease of use.